When I returned from E3 last week, I finally sat down and accomplished one of my greatest gaming achievements in a long time. With a lot of gracious help, I gained the last “ding” on my Demon Hunter. It felt pretty damn awesome. 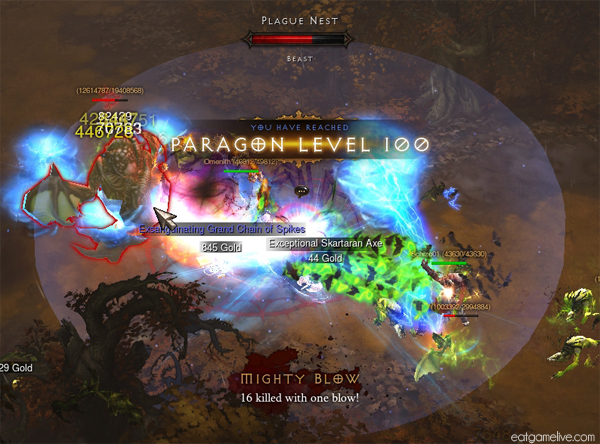 That’s right — I’m officially Paragon 100. It was a long perilous road, which was made much longer by many many distractions. Some of those distractions rhyme with shmeddit. LOOK AT THIS GEM I FOUND. I remember when I first bought Diablo III. I took three days off of work in preparation for an all-out grindfest (which was cut short because I really, really wanted to sleep). Initially I had pre-ordered the Collector’s Edition, but when I realized that I wasn’t going to be able to play at midnight release, I went ahead and purchased a second copy. That’s right, I bought an extra copy just to play at midnight. I even planned out meals for our Diablo III “launch party” in order to ensure optimum leveling time. These pictures were taken with my phone, so the quality isn’t amazing. 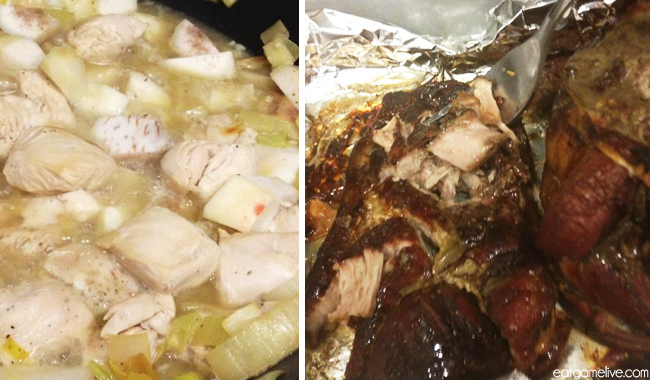 Chicken with taro and leek (left) and Kalua Pork (right). 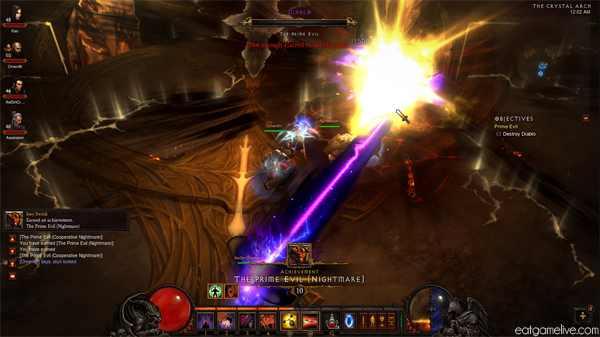 We charged through normal and nightmare mode, and within a few days, we were nearing level 60. Killing Diablo through each mode was pretty darn satisfying. BOOM! On May 18th 2012 (I only know the date because I posted my level 60 picture to Facebook. Yeah, I’m that nerdy), three days after launch, I finally hit 60. At that point, it was time to hop into Inferno and SUFFER. Inferno was so incredibly hard that my team couldn’t even handle Act I. Skip to many months and many patches later, Paragon levels and Monster Power gets released and the Diablo III world gets turned on its head. And so began my long hike to 100. GETTING TO PARAGON 100 IS REALLY HARD IF YOU’RE SUPER LAZY LIKE ME. I took many breaks from Diablo leveling to play other games, work on my blog, relax, and create new recipes such as this one. Wishful Essence is typically a crafting material used from disenchanting gear found in Hell difficulty. In this case, the powdery blacksmith material has been transformed into a delicious soup with BACON. I won’t lie, I really enjoy bacon, but I try to moderate my bacon intake. But, since this recipe is so darn healthy, it’s definitely a good excuse to throw bacon into the mix. 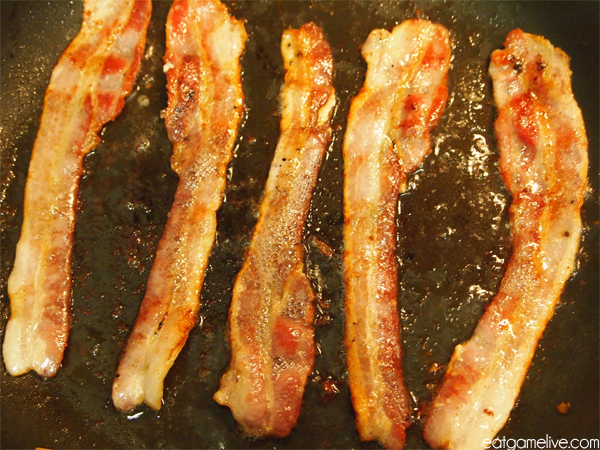 Mmm, bacon. Total prep time for this dish is roughly about 20 minutes. Total cook time is about 45 minutes. This will make 4 servings. Fry your bacon on high heat. Season with cumin. When the bacon is cooked, immediately remove from the pan and place on a few paper towels in order to absorb the extra oil. Once you’ve fried all your bacon, drain most of the oil from the pan (ideally, place it in a disposable can or cup because grease can clog your drain). 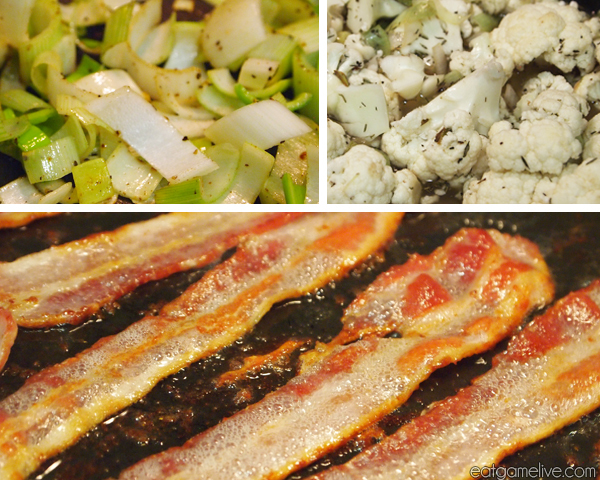 Saute your chopped leeks in the bacon fat for about 1 1/2 minutes, or until golden. Season with salt, pepper, and thyme. Add in your white wine to your leeks. Let cook for about 2 minutes. Remove from heat when done. Set a large pot on medium heat. Add in your chicken stock. Add in your cauliflower. Season with salt, pepper, and thyme. 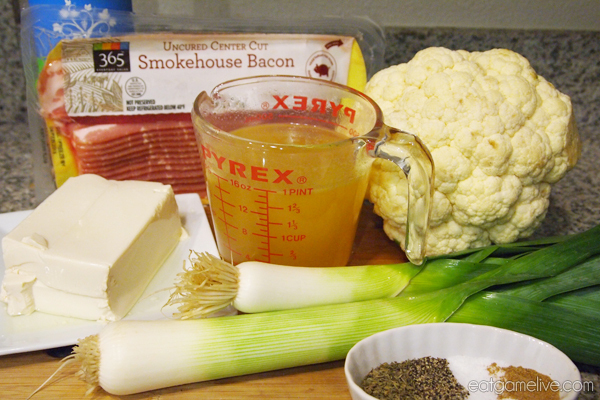 Allow cauliflower to cook until soft (roughly 15 minutes). Pour in the leeks and wine from other pan into the pot. Using a whisk or a fork, beat your silken tofu into smooth paste. Use the some broth from the soup to thin out the silken tofu and bring it to temperature. Add the silken tofu to the soup. Using a stick blender, blend the soup together. Crumble 3/4 of your bacon and add it into the blended soup. Stir to combine. Reserve the remaining 1/4 as a garnish. Pour desired amount of soup into a bowl. Garnish with crumbled bacon. Unfortunately, you can’t use this soup to craft gear for Hell, but you can eat it while you farm in Diablo III. Also, bacon. This entry was posted in diablo, soup by admin. Bookmark the permalink. Check out my friend’s food blog. 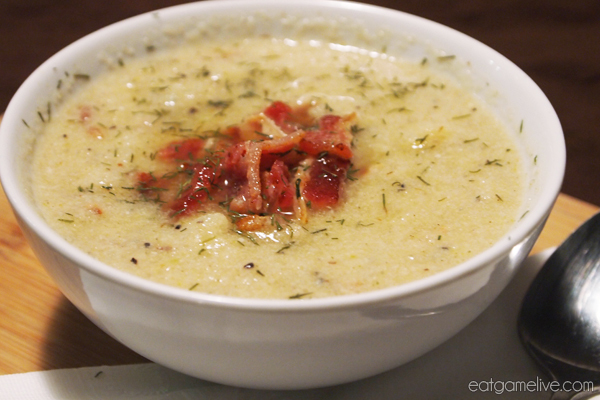 This week’s update: Cauliflower Bacon Soup!